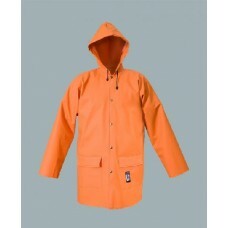 The model fastened with snaps with a hood and 2 welded pockets with protective flaps. The jacket is made of PVC/polyester fabric, called Plavitex. Thanks to double welded high frequency seams the product protects against rain and wind. Conforming to EN ISO 13688, EN 343.